Image caption Since it came into service in May 2017 the chain ferry has broken down, run aground and been suspended by the Maritime and Coastguard Agency due to "training issues"
A chain ferry on the Isle of Wight which has been beset with problems is to undergo further remedial work - this time to tackle noise and vibration. Since launching in May 2017, Floating Bridge Number 6 has run aground, broken down and remains unable to operate during certain tidal conditions. In the latest attempts to resolve the problems, the slipway at Cowes will be fitted with matting. A "shoe" will also be fitted to the end of the vessel's ramp next week. The £3.2m vessel, which links Cowes with East Cowes, will be out of service on Tuesday evening from 19:00 to 23:30 BST while the matting is fitted and again for the shoe fitting which will provide a flat landing point for the ramp. Isle of Wight Council leader Dave Stewart said the authority remained "determined to make the necessary improvements to the floating bridge". Soon after the ferry's launch in May 2017, car bumpers were scraped as vehicles disembarked and it suffered an electrical fault on its second day. 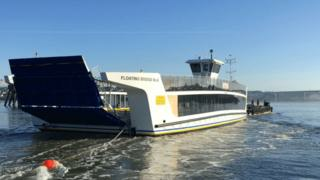 It has been in and out of service due to problems including night-time noise, running aground and a broken prow chain. Currently, the vessel cannot run during a fast-flowing spring ebb tide due to the depth of the chain - which poses a risk to other vessels. Local shipbuilder, Wight Shipyard, has been brought in to try and rectify some of the problems. The journey by road from Cowes to East Cowes is about 10 miles (16km). Image caption The noise from the ferry has been described as "disturbing and distracting"
9 June - Council said it had cleared "silt build-up that caused the floating bridge to ground"
15-16 July - Out of service for "improvements"